The Italy Food Pantry wishes to thank everyone involved in making the Thanksgiving Food Pantry a HUGE SUCCESS for our families in Italy who needed assistance this year. Stafford Elementary donated over 3,000 canned and boxed foods! Thanks to Brookshire Bros. market for helping us obtain several items at discounted prices. Monolithic Constructors donated 104 turkeys, and around 120 families were provided with a Thanksgiving dinner and assistance that they would not have received had it not been for the wonderful people of Italy. 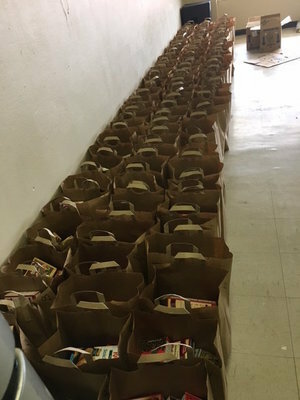 Thanks also to Sean Horton and The Cornerstone for letting the Food Pantry use The Cornerstone—this year’s donations did not fit in the Food Pantry. Finally, thanks to the many generous donors and volunteers who made this year’s program possible. I cannot thank you enough for your love, prayers and assistance!